The Grizzly Locker is the latest in high-performance traction geared towards today's serious racers & off-road enthusiasts. 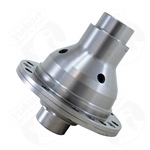 Yukon Gear & Axle spent years engineering a better locker to stand up to tall tires & big horsepower. The Grizzly Locker is a mechanical locking differential. It features a forged case and 8620 internals for maximum strength. Its patent pending design reduces common locker failures. The inner clutch teeth have an improved design with a larger radius at the base, improving strength over back-cut designs. These larger teeth help to avoid breakage against shock-loading or in the event an axle breaks. All units assembled in the USA! Yukon Grizzly Lockers come with an unconditional warranty for one year. Yukon covers the replacement of the unit "and" any collaterally damaged parts and associated labor, up to $2,000.